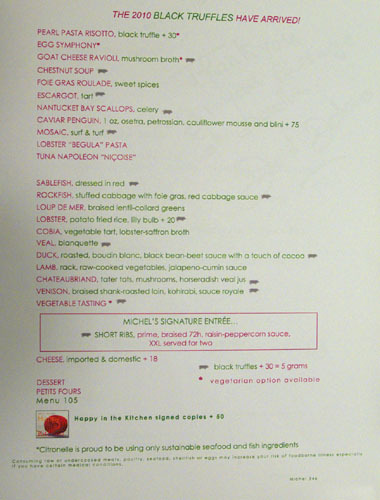 Years ago, when I was just starting to get interested in food, I happened to be in Washington DC for business, and had the opportunity to dine at Michel Richard's Citronelle. That dinner was, at the time, arguably the best meal I'd ever eaten. But since those were my pre-blogging days, the details of what I ate have been lost to time. As such, I was eager to return, and another work-related trip to DC provided the perfect opportunity. Michel Richard's culinary journey began when he was only a child, after catching a glimpse of the magic and mystery of a restaurant kitchen. He began his formal training at age fourteen, when he apprenticed as a pâtissier at a restaurant in Reims, Champagne. 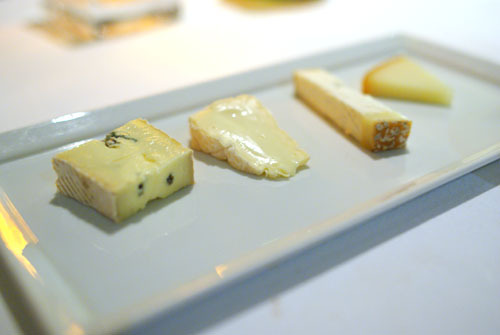 Three years later, the Chef moved to Paris, where he established his reputation working under the legendary pastry chef Gaston Lenôtre. In 1975, Richard relocated to the US, first helming Lenôtre's short-lived Chateau France in New York before landing in Santa Fe, New Mexico. Although he achieved some success there, operating a small restaurant called The French Pastry Shop at La Fonda Hotel, he eventually found the city stifling, and moved to Los Angeles in 1977. 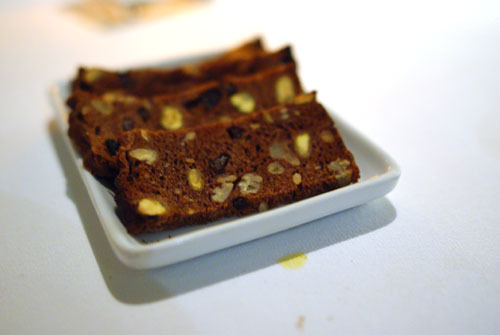 In LA, Richard opened his eponymous pâtisserie--Michel Richard--to resounding success. This allowed him to perfect the savory side of things over the next ten years, and the Chef eventually partnered with Marvin Zeidler to debut Citrus (at the location of the new Hatfield's) in 1987. Citrus blended traditional French methods with California flair, and achieved near-instant acclaim. Then, in 1991, Richard opened the first Citronelle at the Santa Barbara Inn Hotel. Empire building continued, and the Chef went on to open Bistro M in San Francisco, Citronelle in Baltimore, Citronelle in Philadelphia, and, in 1994, Citronelle in Washington DC at The Latham Hotel; he even owned a stake in Santa Monica's Broadway Deli (in a partnership with Zeidler and restaurateur Bruce Marder of Capo fame). At this point, he was stretched too thin, and thus, in 1997, Richard decided to focus solely on the DC restaurant, divesting his stake in his other eateries. However, the desire to expand would rise once again, and in early 2007, Richard opened Central, a bistro concept, also in DC. The same year, he would debut Citronelle at Carmel Valley Ranch (shuttered after the hotel was sold in 2009), and revive the Citrus name at the ill-fated Citrus at Social in LA. Richard, of course, doesn't do much cooking these days. 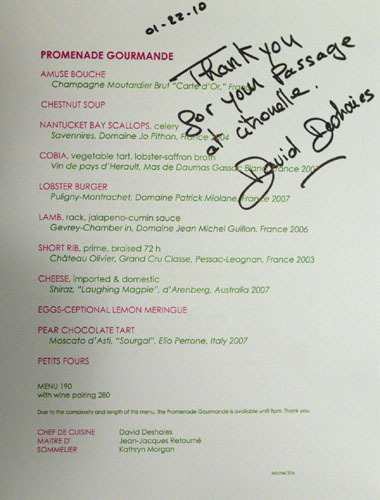 For that, he leaves it up to his Executive Chef, David Deshaies, who toqued at Hotel Pralong in Courchevel, France, Restaurant Ses Rotges in Mallorca, Spain, and La Cote Saint Jacques in Joigny, France before starting at Citronelle in 2005. Rounding out the team are Pastry Chef Mark Courseille (Le Paradou, Hôtel Le Saint-James in Bouliac, La Buvette in Bordeaux), Sommelier Kathryn Morgan (2941 Restaurant, Ristorante Tosca, Occidental Grill), and affable Maître D' Jean-Jacques Retourné (the former head of l'Ermitage and Citrus in LA, who's been with Chef Richard for over 30 years). Inside, things are tame, perhaps a touch tedious, but refined, draped in shades of maize. One side of the room is dominated by the luminance of the exhibition kitchen; a giant mirror covers another. Private rooms are also available. Menu options include a three-course prix fix at $105, or the nine-course Promenade Gourmande at $190 (plus $90 for wine). Click for larger versions. At one time, an even grander degustation was available, but apparently, it was removed because it was simply too much food. 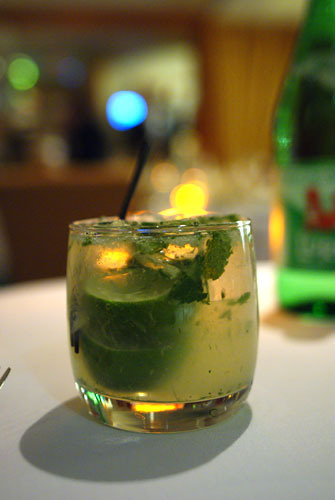 To start, I reverted back to my old ways and ordered up a Bubbly Mojito [$13], with Rum, Champagne, Mint, and Lime; it was basically your typical mojito, but with the addition of carbonation. 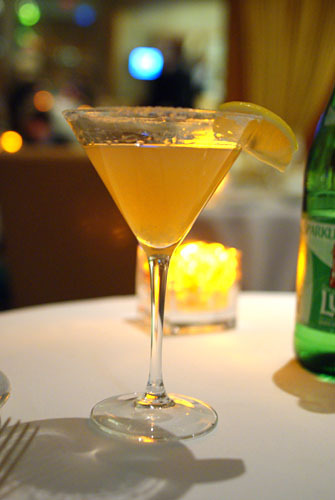 My dining companion's drink, the Parisian Sidecar [$18], was much more interesting. Composed of Hennessy Cognac, Cointreau, and Lemon Juice, I described it as "adult orange juice," noting its strong body of citrus, back by just a hint of brandy. 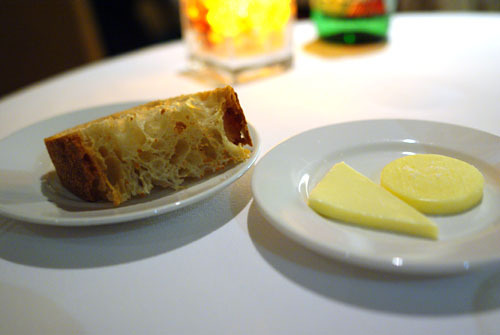 Bread service consisted of a solitary sourdough, served with salted (circle) and unsalted (triangle) butters. 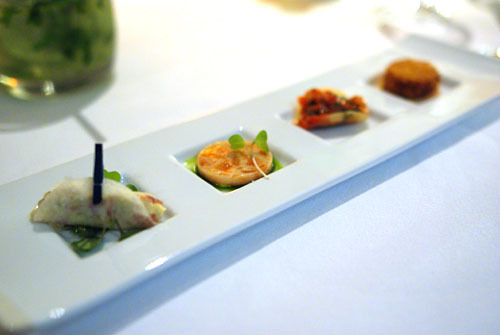 Mini Crab Cake - A classic interplay between the salty, savory crab and its sweet aioli condiment. Ratatouille Taco - A tangy, refreshing, almost salsa-like amalgam of various veggies, wrapped in a "taco shell." Smoked Salmon with Basil Oil - The intense, almost "hammy" savor of the salmon was lightened nicely by the application of basil. Jicama Crepe with Potato and Prosciutto - I loved how I was hit first by the cool crispness of the jicama, with the fantastic weight of "potato salad" coming in later. 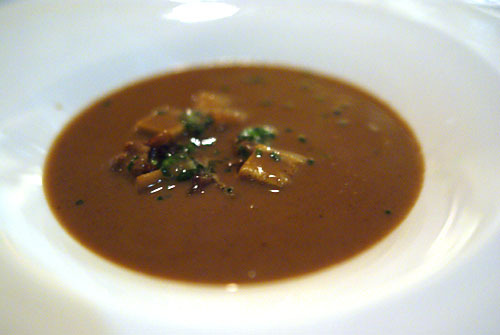 Next up was an admixture of mushroom, shallot, dried foie gras, and peanut butter-foie gras flan, to which a chestnut soup with foie gras and duck jus was added. Flavors here were hearty, dark, with strong earthy and nutty notes--"tastes like winter." 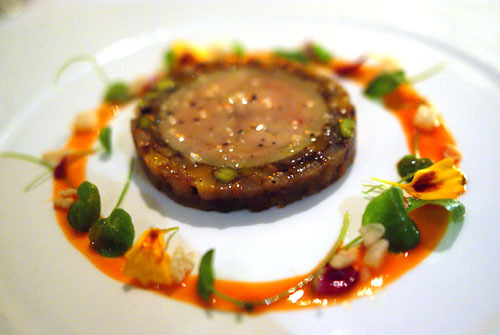 Our first of two supplemental courses was this disk of foie gras pâté, encircled by a layer of fruit chutney, then circumscribed by a ring of carrot-ginger emulsion. 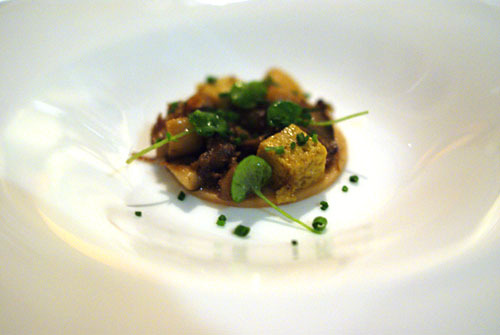 As expected, the foie itself showed off its characteristic tastes and textures in droves. The chutney, meanwhile, acted as an almost too sweet counterpoint to the liver, while the emulsion added a piquant temper. Scallops were up next. Buttery, savory, and naturally sweet on the finish, the bivalves were nicely balanced by the celeriac reduction and the greens. 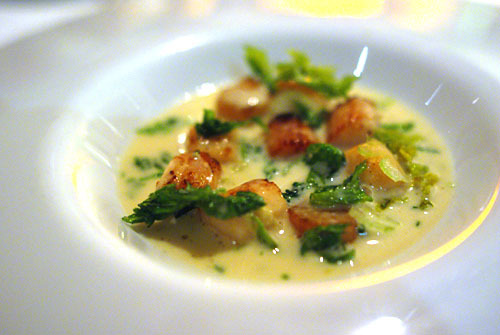 However, I really would've liked to have seen large scallops here, so I could better appreciate their texture. 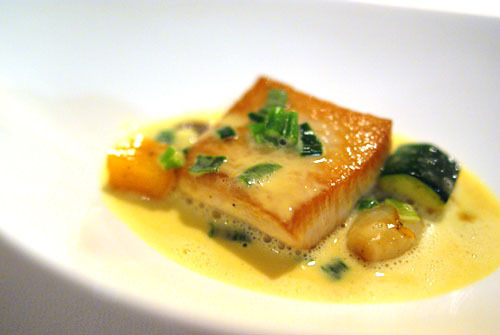 Cobia is a relatively uncommon fish on menus, and the last time that I had it was at Sage in Las Vegas. As usual, the fish was firm, flaky, and stupendously savory, with a delightfully crisp skin. I loved how the cobia's brininess was preserved here, and how the various veggies--zucchini, carrot, pearl onion--helped in moderating its power. The broth, meanwhile, with its almost buttery lobster bisque-like sapor, was delicious on its own, and I eagerly mopped up the excess with bits of sourdough. 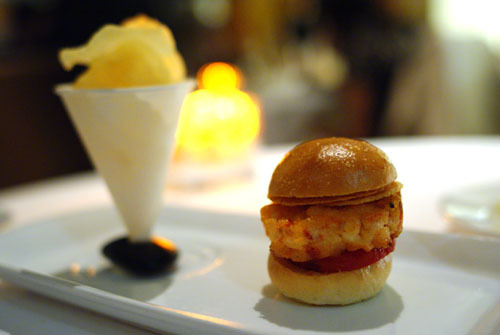 Upstairs, in the Lounge, diners have a choice of a variety of burgers, the most luxurious of which is the lobster burger seen here. Constructed with scallop and tomato confit, it was very, very good. I really appreciated how the sweet-briny essence of the crustacean was highlighted, and how its texture was soft, snappy, spot-on. I wanted a full size version! Meanwhile, the accompanying potato chips, fried in clarified butter, were easily the most decadent example I'd ever had. 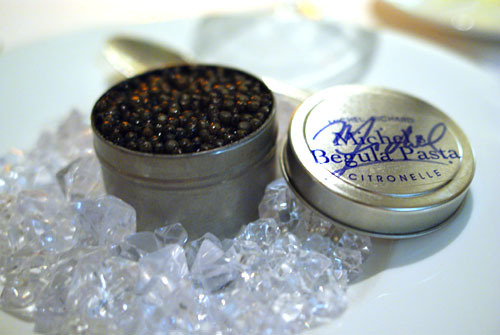 Our second add-on was Michel's famous faux caviar. The "Begula," an accidental misspelling of "Beluga" that the Chef found amusing, consists of squid ink pearl pasta over a layer of lobster and egg. 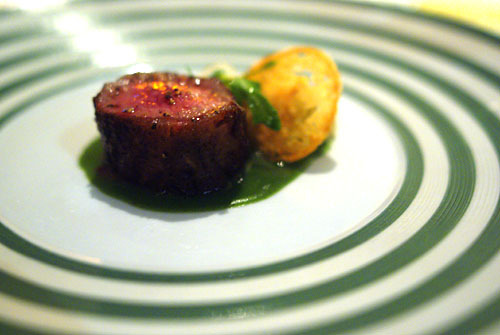 The "roe" was nicely firm, with a mild flavor that did a fantastic job in countering the luxuriousness of the lobster. And what a lobster! Incredibly buttery and rich, the crustacean was elevated even further by the use of runny egg yolk, while bits of toast added some textural play. Classic flavors, but superbly done. Sure, the lamb was perfectly done, wondrously toothsome with that signature "lamby" flavor. And the potato, sunchoke, and zucchini were also great garnishes to the dish. It was, however, the jalapeño-cumin condiment that made this one of the best lamb dishes I'd ever had. The sauce, quite simply, with its simultaneously spicy and earthy savor, was the perfect complement to the gaminess of the lamb. Astounding. Our final savory was Michel's signature dish, a slab of sous vide beef short rib, drizzled with an Armagnac-raisin-peppercorn sauce, with sides of tater tots, rutabaga, carrot, and zucchini. It was amazing, one of the best pieces of beef to ever touch my palate, in fact. Texturally, the short rib was fantastically tender, but still had a bit of fibrousness to it. In terms of taste, the meat was positively teeming in bovine sapor, while the peppercorn really made its mark on the close, imbuing the dish with an almost beef jerky-like finish! Gorgonzola - The famous Italian bleu cheese. Soft, creamy, and salty, with that prototypical blue tang. Camembert - From Normandy, this cheese was delightfully soft, with a rich, nutty, grassy flavor that I rather liked. Leonara - From Spain, this was a tangy tasting goat cheese with a soft, creamy, mouth-filling consistency. Petit Basque - A semi-firm, relatively mild sheep's milk cheese from the Basque region of France. A pre-dessert course consisted of a faux egg, replete with "nest." 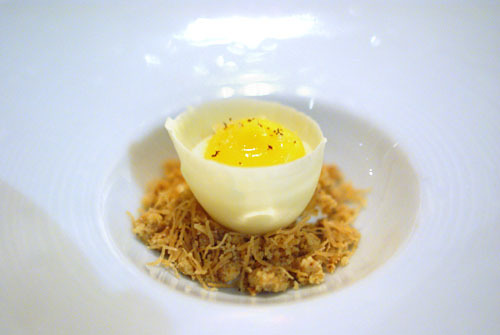 In reality, what we had was a "yolk" of lemon meringue, with a white chocolate shell and cookie crumbles. Eaten together, the whole thing tasted like a lemon tart. We closed with a sort of cookie cake, served with pear and pear meringue, topped with vanilla ice cream. The interplay of the chocolate and the fruit was surprisingly good, with the pear tempering some of the chocolate's sweetness, while the tart contributed a fabulously crunchy texture. 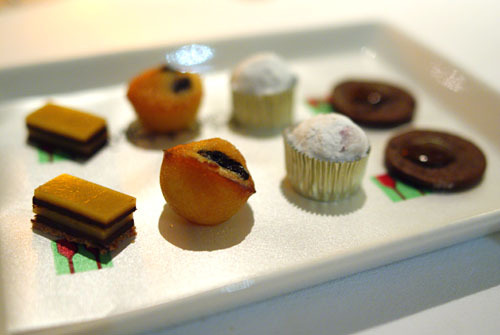 A plate of petit fours: chocolate-hazelnut bar, raisin madeleine, chocolate covered grape, chocolate cookie. All quite delicious. Following our meal, we were brought into the kitchen. Above, we see the pass, as well as the Chef's Table. Initially, we'd wanted this vantage point, but the Chef's Table at Citronelle requires at least six people, and starts at $350 per person for a 10-course meal matched with wine. My return to Citronelle, thankfully, was nearly flawless. The magic, the mystery, the playful whimsy, all of that was on the plate, combined with Richard's brilliant take on contemporary French cuisine. Though Citronelle may not be the best meal I've ever had at this point, it's not too far off. Glad you had a good experience at Citronelle. I had a wonderful meal there a couple summers ago. 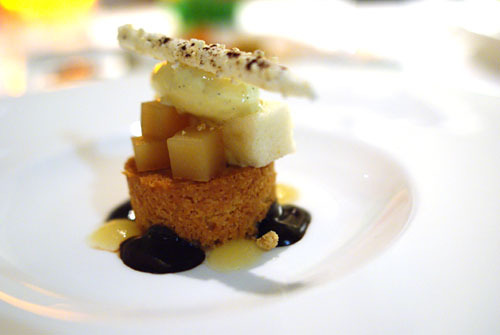 I'm surprised you didn't have Richard's signature dessert: the chef's take on a Kit Kat. Is this still offered? Glad to see you made it to my neck of the woods. I completely forgot a while back I promised to post a followup about my meal at Minibar (which was fantastic), did you make it there on this trip? I hope so, I had a great time there. I actually didn't read this post too closely because I'm going to Citronelle for the first time next month, and I don't want to spoil anything. Michel is closing the restaurant sometime in the near future and will open a new signature restaurant in Northern Virginia, so I wanted to get in to the original. Oh, and I'd be remiss to not mention that Citronelle is not in Virginia, as close it may be. If you don't want two categories, I think Mid-Atlantic would work nicely. wow impressive. if i'm ever in DC, looks like this will be the one place I will have to go to. nice detailing of your meal, really got the sense that you enjoyed it. Josh: Good catch on the Virginia--I must've been tired when I posted this. ;) I added a separate DC category. As for Minibar, I tried to get a reservation, but alas, nothing was open--next time though. I actually had no idea that Citronelle was closing. When? And why? Matt: Yep, this is the place in DC for fine dining. And yes, I did really enjoy it--great to finally come back! Now you got me excited for my upcoming trip. I usually scan through your photos rather than read the descriptions since I suffer from what execs call "EADD" (Executive Attention deficit disorder). ... my first "gourmet" dinner out was also here! On a nasty February night when the theater was closed and everyone was bickering. And just like you said--magic and whimsy. They had, especially, a spinach-basil soup which tasted like Essence of Fresh Buttered Greens. So good. One of my best meals, still--and we left in a good-humored haze. (wine sure--but I blame the dulce du leche cheesecake). You know I always come to your blog to read about the places you find and go to, but never leave a comment. Now that you have a few posts from DC I'm just wondering if you found your way to Volt restaurant. Have been interested in seeing you compare that with his brothers place. Looks like a great meal Kevin. That lobster "begula" pasta dish sounds delicious! Jocelyn: Be sure to let us know how it turns out! Have you finalized your eating plans for DC? Perry: They set the bar high--sounds like an epic experience! Tommy: I actually planned to go to Volt, but things didn't work out unfortunately. I ended up at Central instead. Jane: "Stupendously savory" ain't nothing--try "venerated, veritable veteran of victuals!" Danny: Yep. Are you ever planning to do a DC food trip? This is an old article, and he probably won't be moving for a while, but I've heard it enough that it does seem like it will happen eventually. Thanks for the link Josh. If Richard does make the move, I'd almost prefer that he close Citronelle, rather than let it wither. We'll see! Ah yes, the Kitchen Table. Next time hopefully! Yes, eating plans are now complete. I landed MiniBar this morning! So the lineup is MiniBar, Palena, CityZen and Citronelle. Nice line up! Palena is one that I hadn't considered before. I'll probably be going back to DC in March. I hope you hit up minibar. You need to get through within 5 minutes once the phone lines open. By the time I called, there was only 1 seat left for the last seating at 8:30pm. 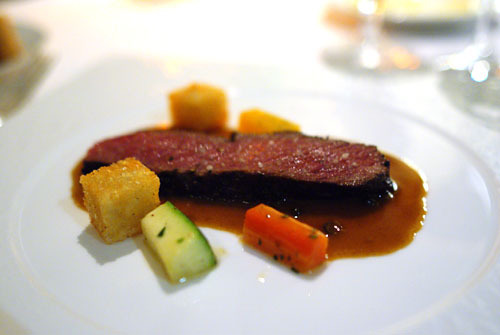 Did you land elBulli this year? I can't believe it's permanently closing. So sad. When do the phone lines open? The problem is that I'm not sure exactly when I'll be around. The phone lines open at 10am EST, 7am PST. Start dialing at 6:59:55 AM. I had to redial 22 times before getting into the queue (roughly 5 minutes). I waited another 7 minutes on hold until someone came on the line. Very intense to get one of twelve seats. Their website states seats are filled within 15 minutes. Yikes. That sounds like my experience with trying to get a French Laundry reservation! I guess I won't hold my breath. I just got back from Citronelle and I had a great time. 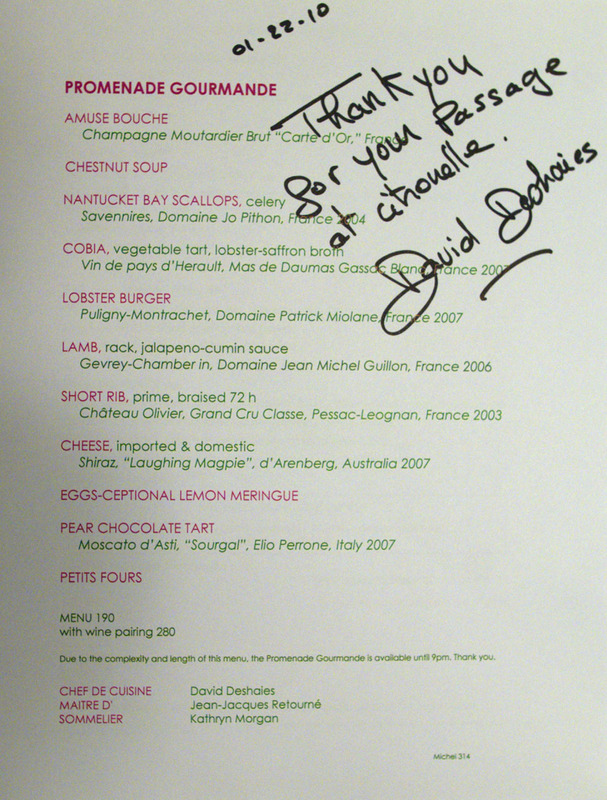 The servers were oh so nice and I even got to meet the man himself, Chef Michel Richard. He walked over to my table since I was dining alone and introduced himself. I can't believe he kissed my forehead. Must be a French thing. Did your server give you a book? 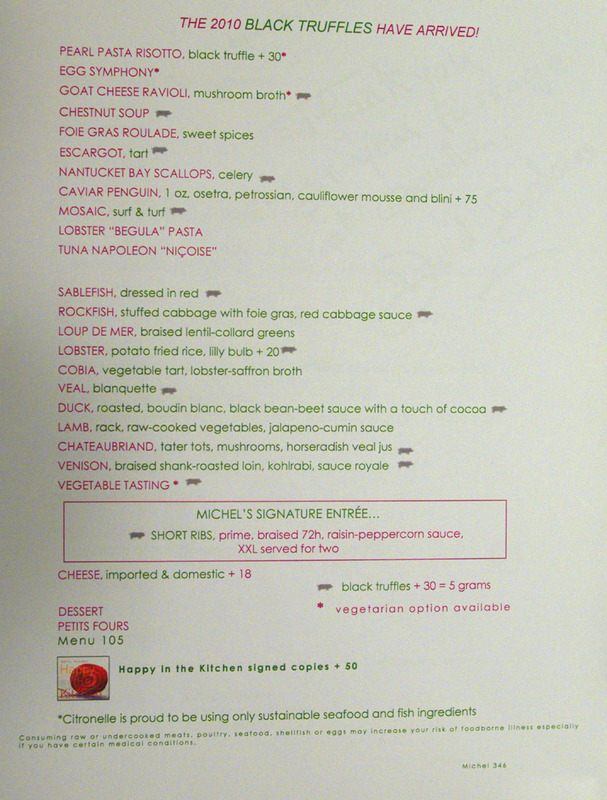 Aside from the menu, I got this book called Les Grande Tables Du Monde, 2010. It's sort of a guide that contains info of various restos in Europe. Oh, I had the full size Lobster Burger at Central and it was heavenly. Lucky that you got to meat Richard--we missed him here and at Central! Why Are There So Many Asian Food Bloggers?